The choices we make in home and custom garage improvements are generally driven by one of two factors: either we make upgrades for our own pleasure, or we plan to sell the house soon and are making improvements that will help it sell quickly for the best price. Ideally, we take both factors into consideration. One important consideration is generally the payback value of a project. The payback percentage represents the increase in home value relative to the project cost. On the list of home improvements with the best payback, garage doors and other garage improvements are near the top. Garage door and entrance door replacements rank near the top of all home remodeling projects for their payback value, according to the Remodeling 2018 Cost vs. Value Report. 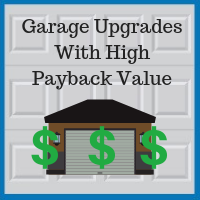 In the Chicago market, installing a new upscale garage door (steel with R-12 insulation) has an estimated cost of $3,000 to $4,000 and an estimated payback value of 90%. Installing a new entryway door has an estimated cost of $1,000 to $2,000 and an estimated payback value of 100%. For comparison, bathroom projects have a 50-70% payback value, while kitchen remodels average 50-60%. Remember, however, that the payback depends on many factors, including how outdated the space was and how well the improvement is executed relative to comparably-priced homes in the area. Some homeowners believe that it does not pay to improve a house prior to putting it up for sale; they assume that the new owners will just want to change everything to fit their own tastes anyway. However, that is less true today than it was in the past. “Buyers are inclined to pay more and get a home that is essentially move-in ready, rather than pay less for a home they must fix up. Sweat equity doesn’t have the appeal it did 20 or 30 years ago,” said Jeff LaGrange, Vice President, RE/MAX Northern Illinois Region, when speaking to the Daily Herald last year. Blue Sky Builders has served homeowners in over 50 communities in Cook County, DuPage County, and the surrounding area for four decades. We can build a new custom garage for you or repair your existing garage. We are a full-service builder, handling permits, demolition, concrete, siding, roofing, windows, garage doors, door openers, and side doors. Call us at 630-852-8485 to talk to one of our expert Chicago garage builders and get a free quote on your project.